Not the greatest ale selection on a visit last night - George Wright Mark's Mild, Titanic Plum Porter & First Class, Fyne Ales Hurricane Jack, Rat White Rat & Hawkshead Windermere Pale. Still one of the best boozers in the city though. Owner and staff won't be to everyone's tastes but still one of my favourites in this part of town. Had a couple of superb pints of Titanic and Rat White Rat last weekend. Friendly punters. @Snarling_Mallard Laugh out loud! You always crack me up with your reviews! Still find this a pleasant old school old man's alehouse with decent ale. maybe being an old get makes it more appealing to me. Dave was in usual form yesterday. With Everton winning, Liverpool losing and me and my mates having visited other hostelries in the city, he was in a typically sarcastic mood. But you have to take him with a pinch of salt. This is his boozer and his pride and joy. The pub is always packed with people that appreciate the quality of his well-kept and well-sourced ales. So it makes a decent drinking environment. Yesterday's selection was Titanic First Class & Plum Porter, George Wright Mark's Mild, Riverhead Liquorice Latte Stout, Fyne Jagnarok Imperial Jarl, Oakham Citra & Rat White Rat. 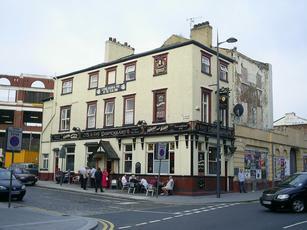 Still our go to pub in Liverpool, despite the lack of a real cider for me. The dark ales generally make up for it. Still thoroughly recommended.